Christopher Eric Hitchens was an English-born American author, journalist, and literary critic. He was a contributor to Vanity Fair, The Atlantic, World Affairs, The Nation, Slate, Free Inquiry and a variety of other media outlets. Hitchens was also a political observer, whose best-selling books — the most famous being God Is Not Great — made him a staple of talk shows and lecture circuits. He was also a media fellow at the Hoover Institution. Hitchens was a polemicist and intellectual. While he was once identified with the Anglo-American radical political left, near the end of his life he embraced some arguably right-wing causes, most notably the Iraq War. 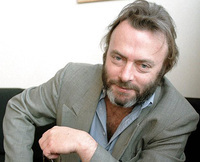 Formerly a Trotskyist and a fixture in the left wing publications of both the United Christopher Eric Hitchens was an English-born American author, journalist, and literary critic. He was a contributor to Vanity Fair, The Atlantic, World Affairs, The Nation, Slate, Free Inquiry and a variety of other media outlets. Hitchens was also a political observer, whose best-selling books — the most famous being God Is Not Great — made him a staple of talk shows and lecture circuits. He was also a media fellow at the Hoover Institution.